The Bobcat Chronicle: Coach Bartley! The awards keep coming in! This year the college and athletic department awarded Coach Mike Bartley with Athletic Department Service Award. Coach Bartley has been an important and integral teacher, coach, and mentor in the Bates College Athletic Department for 18 years. The fact that Mike has been involved in the diving for (we’ll be kind here) 40 plus years as an NCAA Division I athlete, US Olympic Qualifier, U.S. Masters Champion, professional diving performer, high school coach, US Diving Coach, and specifically as Bates’ Diving coach since 1991 allows him to be very independent in his work. He knows just what needs to be done - and efficiently coordinates his efforts making sure everything is in order. His efforts have resulted in amazing performances and achievements. Virtually all of his divers have attained new courage, dedication and improved performance. 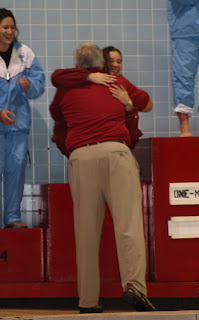 Mike has been recognized by his peers as NESCAC diving coach of the year twice while at Bates. He has developed 5 NCAA All-American divers who have earned a total of 24 ALL AMERICAN awards. B/C most diving coach positions at the Division III level are part time it is difficult to attract committed, competent candidates. 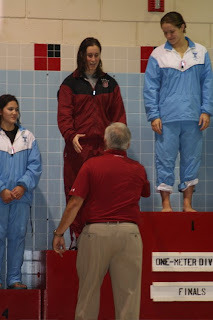 A diving coach is an invaluable commodity to a successful competitive program. We are extremely fortunate to call Mike Bartley ours. Bates can only hope Mike continues to grace us with his presence. He cannot be replaced. Mike represents the best of Bates College.